If there’s one thing the internet does better than anything it’s speed. When you play a virtual casino game, the rate at which the cards fly, the reels spin or the roulette wheel turns is quicker than any live casino. What’s more, the RNGs that power the games ensure everything is 100% random and fair and they don’t get tired. This means fewer mistakes. Linked to the fact online casinos operate in a slicker way is the notion that they’re also more accessible. Today, as long as you have an internet connect, you can play online. Whether you choose to use a PC, a Mac, a smartphone or a tablet, hundreds of games are just a click (or swipe) away. Even the largest casinos in the world struggle to match the selection of games you’ll find inside a site like PartyCasino. Yes, there are venues that hold hundreds of slots, but table games are a different story. Because they take up a lot of space, the range of options is often fairly limited. Online, space isn’t an issue. To this end, you’ll not only find more games online, but a greater mix of variants and stakes. When you play online, you don’t have to be locked into a single game. In fact, you don’t have to stick to the casino world at all. Because today’s casino sites also offer poker, bingo, sports betting and more, you can split your focus in as many different ways as you like. Live venues have high overheads that have to be covered. Because of this, it’s rare to find a casino in the UK that has minimum stakes of less than £3. In fact, if you play blackjack and the like in a major city, the lowest limits you’ll find could be £5 or £10. For most players, that’s too much. In contrast, our partner sites such as Casumo allow you to play table games for £0.10 and slots for £0.01. Loyalty schemes are common in any live casino, but the best deals are often reserved for high rollers. When you play online, you don’t have to spend thousands to get a few comps. If you’re a newbie, you can claim a generous welcome bonus. If you're a mid-level player, there are reload offers and more. Of course, if you play for high stakes, there’s a plethora of ways to earn more, especially when you take into account VIP schemes and cashback offers. We’re not saying live casinos aren’t safe and secure, because they are. But when you join a licensed online casino, you’ll have a number of things working to protect you. 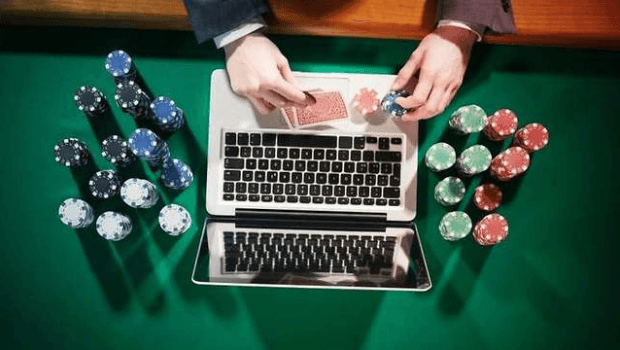 From the SSL secured software and ID checks to segregated bank accounts for your money, the top-rated online casinos have a duty to keep you safe at all times and that’s what they do. This is perhaps the best reason to play at an online casino. Because the industry was founded on new technology, developers are always looking to move with the times. That’s not to say live casinos don’t. However, in practice, they’re often slower at picking up on new ideas. In the iGaming industry, everything from live streaming to virtual reality has been brought into the mix in recent years and this will continue well into the future. Many of our recommended online casinos will offer perks that can be utilised in the real world. For example, if you use a site like Paddy Power, you’ll be able to collect a withdrawal inside one of the company’s high street betting shops. Similarly, if you play at the Hippodrome Casino Online, any loyalty points and rewards can be transferred to the live venue if you visit London. The final thing online casinos seem to do better than their live counterparts is give you tips and insights. For example, if you’re completely new to a game, the best online casinos will have instructions and guides to help. Inside the games themselves, live dealers will prompt you when necessary, while stats tracking features give you a better overview of the action as well as your results. We think online casinos are a great place for everyone to play. However, if you’re still not sure, check out our partner sites and try some games yourself.